One of the primary reasons patients visit us at A Plus Dental is so we can find dental problems before they turn into serious and costly concerns. While physical examinations can detect apparent issues, some oral problems just aren’t visible to the unaided eye. This is why dental X-rays are such a critical tool in dental care. Dental X-rays can uncover even the slightest traces of oral health problems at their earliest stages, such as cavities, gum disease, oral infections, and some types of tumours. Thanks to dental X-rays, we can diagnose and treat dental problems long before they become more serious. With the early detection that X-rays allow, you can get the treatment you need before problems have a chance to develop. If you’re a new patient, you’ll likely receive dental X-rays to give your dentist a clear picture of your dental health. Children may need dental X-rays more often than adults because their teeth and jaws are changing far more rapidly than those of adults. 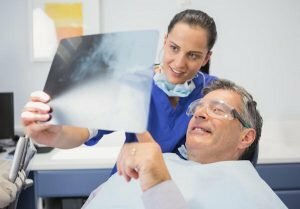 What issues can dental X-Rays detect? Bitewing, periapical, and panoramic radiographs are the X-rays most commonly used in dental offices. During routine exams, a dentist may take two to four bitewing x-rays – which show the crown portions of your teeth – to spot early signs of decay between your teeth. Periapical X-rays provide the best view of your teeth’s bone height or root tips. A panoramic X-ray is taken from outside the mouth and gives a view of the entire oral cavity in one large image. Because the image shows all of the teeth, the upper and lower jaws, and the sinus areas, this type of X-ray can identify cysts, impaction, tumours, bone irregularities, and jaw disorders. Other radiographs include occlusal X-rays, which are sometimes taken in children to evaluate their teeth as they develop, and cephalometric X-rays used by orthodontists to assist in planning orthodontic treatment. How often should X-rays be performed? Dental X-rays are typically performed once a year. They can be given more often if your dentist is keeping track of the progress of a dental issue or treatment. The frequency of X-rays on your teeth is related to your medical history, dental history, and overall condition. Some people may require X-rays twice a year; others with no recent oral issues and who visit their dentist on schedule may get X-rays only every couple of years. For most new patients, dentists take X-rays as part of a complete initial examination to establish a basic platform from which to compare changes that occur over time. Patients with extensive dental work. People who drink too many sugary beverages (as a sugar-filled mouth creates a perfect environment for cavities to develop). People who suffer from dry mouth—or xerostomia — whether due to medications (such as antidepressants, anti-anxiety drugs, antihistamines, and others) or other issues (such as damaged salivary glands, Sjögren’s syndrome, or radiation treatment to head and neck). Dry mouth can lead to the quick development of cavities. Not all x-rays are the same, but even most X-rays to the body pose minimal exposure to the mother and developing fetus. During dental X-rays, there is hardly any exposure to anything but the teeth. 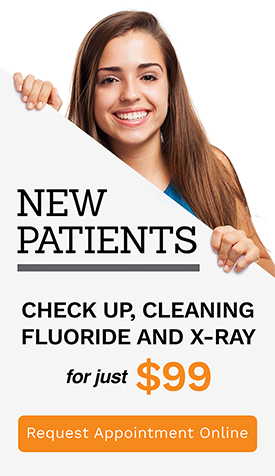 $99 new patient deal which includes check up, cleaning, fluoride treatment and 2x xrays.